Los Angeles, 1999. Officer Dave Brown (Woody Harrelson) is a Vietnam vet and a Rampart Precinct cop, dedicated to doing "the people's dirty work" and asserting his own code of justice, often blurring the lines between right and wrong to maintain his action-hero state of mind. When he gets caught on tape beating a suspect, he finds himself in a personal and emotional downward spiral as the consequences of his past sins and his refusal to change his ways in light of a department-wide corruption scandal seal his fate. Brown internalizes his fear, anguish and paranoia as his world, complete with two ex-wives who are sisters, two daughters, an aging mentor dispensing bad advice, investigators galore, and a series of seemingly random women, starts making less and less sense. In the end, what is left is a human being stripped of all his pretense, machismo, chauvinism, arrogance, sexism, homophobia, racism, aggression, misanthropy; but is it enough to redeem him as a man? Rampart images are © Millennium Entertainment. All Rights Reserved. Every so often, there is a movie that is lifted up from an otherwise mediocre state by a piece of acting that's so on-the-spot it makes the rest of the film's faults insignificant, and lifts the it up from the pit of mediocrity into the realm of the fantastic that you're certain to see glowing reviews from the four corners of the world any minute now. Unfortunately Rampart is not that movie. Despite getting strong buzz from the festival crowds, this Los Angeles-set police drama starring an impressive Woody Harrelson as an embattled officer has only two speeds: slow and screeching halt. A ponderous character study of a broken but possibly redeemable man; it lacks the art-house weirdness, and at times seems to be without a plot or sense of direction. The movie is all atmosphere and paranoia but little in the way of momentum, with strings of plots that seem to rear their heads now and again and the hint of something truly interesting that's about to happen and never does. This is, however, a cinematographer's dream: with so little going on, Rampart is generally content to linger on long, significant-looking and artfully-framed shots of its antihero chain smoking in his cruiser. At least, though, Harrelson looks good smoking them. Brooding behind a pair of aviators and those universal death sticks, his performance as a casually racist policeman named Dave Brown is so strong it occasionally breathes life into the movie at some of its more interesting moments, but there is very little reason given for his character's existence. He seems to have dropped out of the sky with Vietnam flashbacks and a short temper, and once he beats a man up after a car crash he all of sudden finds himself the scapegoat for the more widespread corruption of the LAPD. This much should be said for the movie: it does a good job, in the few minutes it broadens its gaze from Dave, of capturing the general apathy of the City of Angels back in the 1990s, where this movie takes place. The problem is, it generally has no interest for anyone other than Dave, and its story is so muddled it forgets to move forward. Director Oren Moverman, who also made The Messenger with Harrelson, clearly knows his way around his lead, but this movie seems to get away from him almost entirely. 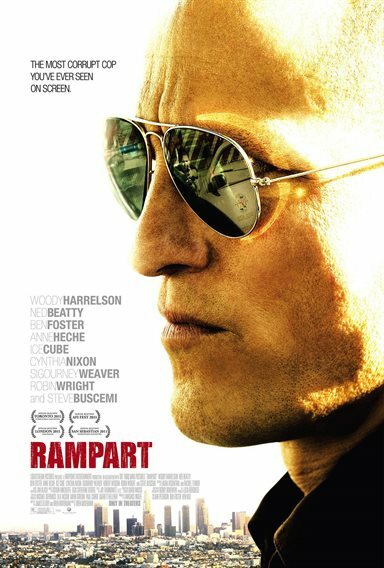 By the time the credits roll, Rampart is more notable for what it's failed to accomplish than the grit and strength of Harrelson's acting, which is a shame. Well, notable for that and for a parade of pretty famous half-cameos that briefly add life to the proceedings, only to fizzle out when you realize that nobody besides Harrelson is given anything to do. Oh look, there's Sigourney Weaver doing her ice-queen thing; Steve Buscemi showing up for a scene and a half, and Robin Wright as a lawyer who may or may not be targeting Dave. Ice Cube's in this movie, too? Sure, why not? Toss them all in; this movie is what it is and it's not what it could have been. Might as well light up while you're here.